In this article will are going to look at the best propane generator for home use. We have narrowed our product choices to portable versions these can then be used not only for around the house but also for camping, RVing, Tailgaiting etc. We have done in-depth research on each model and read thousands of reviews to save you time and give you the best information. 3 What Size Generator Do you Need? 4 Who Makes the Best Propane Generator? 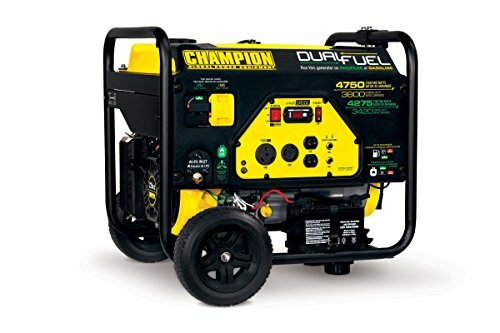 If you are in a hurry and just want to know what our top pick then we really recommend the Champion’s 3800-Watt Dual Fuel Generator. You can scroll down for a more detailed look at the product but if you want just the bare bones bullet points why we went for this particular generator then here you go. Liquid propane has an unlimited lifespan especially if it is stored properly. This makes propane a perfect option for you if you might require a backup power source down the road and don’t want the headache of needing to go and purchase gasoline. 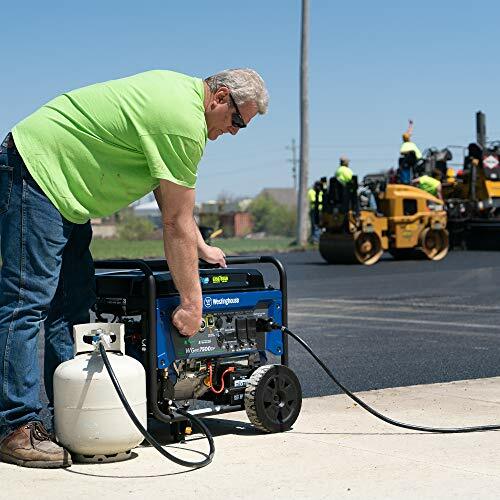 Propane Generators, on the whole, are usually much quieter than gasoline-powered models. During the course, a power outage over a wide area gasoline stations might not be able to pump fuel making propane fuel an advantage. Propane can be stored easily in small or large tanks and is easily available for delivery in all sizes. One more good reason for choosing propane is that it burns cleanly and is much less polluting as a fuel. It generates lower carbon monoxide if you compare it to other fuels such as gasoline. Propane does have its drawbacks as a fuel system, it is a great deal more challenging than using a gas generator. That means it stands a higher possibility of failing as is harder to repair if it does fail. Many models are now designed to allow you to use both types of fuel giving you even more flexibility and we have taken a look at some of these in our review section further on. When you are buying a generator you will decide on the size you want by its power output in watts. The quantity of power that you decide on will determine the number appliances you are able to run at the same time. Plan around 5,000 watts to take care of your basic essentials. Who Makes the Best Propane Generator? Looking at some online reviews of the best home use Portable Generators they have listed up to 20 models, including some questionable choices. Though we looked at a good number of products from different manufacturers we managed to shortlist 5 quality generators for you to check out. If you are looking for a high-quality and powerful generator and you are not limited with your budget then we recommend taking a look at this model from Westinghouse. This model isn’t designed for tailgating or camping its designed for heavier usage and has the capabilities of powering a whole house if needed. It would make a fantastic generator for a workshop or large RV. while it is portable in the sense that it has wheels and a handle At around 200lbs in weight, you won’t want to be lugging this bad boy around too much. This generator comes assembled except for the wheels and legs which will take all of 15 minutes to install. It has detailed instructions including a quick start guide. It comes with a residential warranty of 3 years/1000 hours or a commercial one of 6 months/ 1000 hours. Reviews online are extremely positive with many users putting it to work during power outages and hurricanes with no issues. Many mentioned that it had saved the contents of their freezers defrosting and the contents of their fridges going off. The electric start is a useful feature but as quite often happens with generators when they haven’t been used a while the battery goes dead but there is a pull start option if this occurs. The only real issue that we heard regarding this product was damaged packaging on arrival but with no damage done to the actual contents. It has a noise muffler feature which gives it a softer sound but it is still fairly noisy though not as much as other generators in the same class. There is little to fault with this generator and compared to other Inverter generators in this class from big brands such as Yamaha it offers the same or more at a better price. Champion has a huge product range of different generators but we are going to look at this dual fuel model. It will provide you with up to 10 1/2 hours run time using propane and its lightweight portability means that its great for RVing or power a cabin retreat as well as making a reliable back up power source for home use. As well as our top pick its Amazon’s choice for Champion Generators. Its Straight Forward to assemble, use and maintain and comes with an instruction manual. This one starts easily using manual-pull, or electric start. 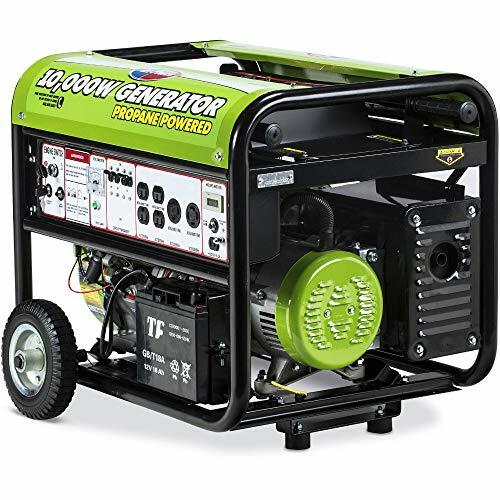 Reviewers commented that it was noticeably quieter than other generators. It will keep all your essentials running during a power outage – Lights, TV and a fridge. Of course, everybody loves the Dual fuel option as well! This is a well-received product and will do the job as a great back up generator for use at home as well as for the RV, camping or log cabin just to name a few uses. Using eco-friendly propane means that you are doing your bit to help the environment and we all know that LPG won’t gum up and foul the carburetor so you will benefit from quick and reliable starts each time you fire up the generator. It comes with an electronic start and a free battery included. There are only a few reviews of this model online at the moment but most users say it runs well and isn’t overly noisy. The only complaint seems to be with the user manual which is a little difficult to read. This 400 Watt generator is able to power everyday home appliances and power tools. 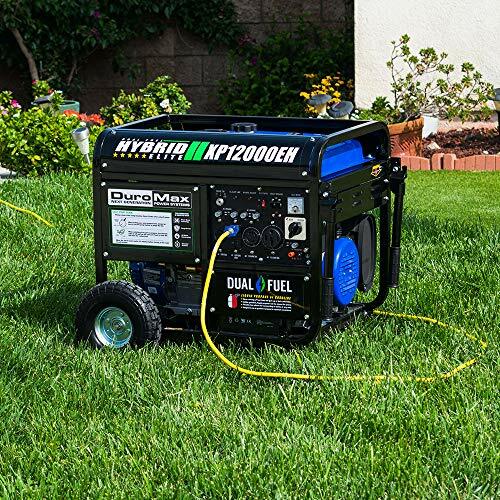 A portable generator with this size is perfect for short camping trips or to available in the event of a temporary power outage or similar emergency situation. 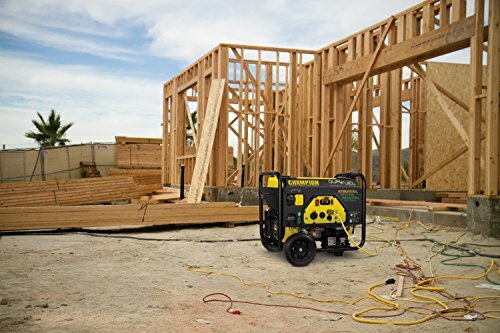 This is an affordable portable generator with some well-considered options including an Automatic Voltage Regulator and Low Oil Shut Off. It provides an engine run time of 10 hrs at 50% on a typical 20lb LPG cylinder. Running at lower than 68DB the engine is remarkably quiet. Reviews online are very favorable and this Sportsman Generator was used for a variety of task with great results. For instance, one user had used it during the construction of an off-grid building in Arizona. He confirmed that a 20lb propane tank running pretty much non-stop would need to be changed sometime in the second day of work. Another guy who had purchased this used it to power a 12 amp chainsaw and described it as performing flawlessly and made it possible for him to cut firewood in a remote area of his property. The main issue reported with the Sportsman was that it didn’t come with wheels so isn’t the easiest generator to move around. It weighs 88lbs so for a relatively strong guy it shouldn’t be a problem to move around. Of course, a trolly, garden cart or even a wheel kit will be easy solutions to solve this. The DuroMax XP12000EH also know as the ‘BEAST’ gives you the same sort of power you would expect from a household standby generator but with all the benefits of a Portable Generator. The product arrives partly assembled you need to put on the landing legs, wheels, and handles. Reviewers loved the quality and that it was made from all metal with no plastic and that it could power a whole house. The Electric ignition was also described as a plus. One user had tested it for three days during a snowstorm outage and said it performed flawlessly for over 14 hours each day. The wheels seemed to be the one area that let this particular model down and you might want to replace them at some point. It was mentioned that other generators with the same specs would you hundreds of dollars more so the cost of some new tires would still more than offset the price. 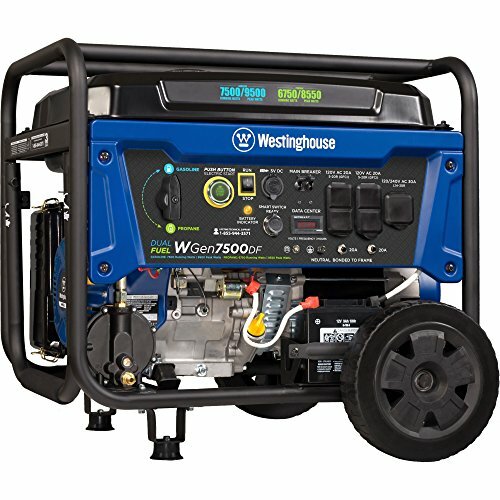 WORKHORSE – If you are looking for a propane generator for the Home, RV, Boat or Workshop that has a great power capacity then the Westinghouse WGen7500DF is the best option. ALLROUNDER – The Champion Dual Fuel model would be best for its versatility it will power your essentials and it won’t break the bank in the process. 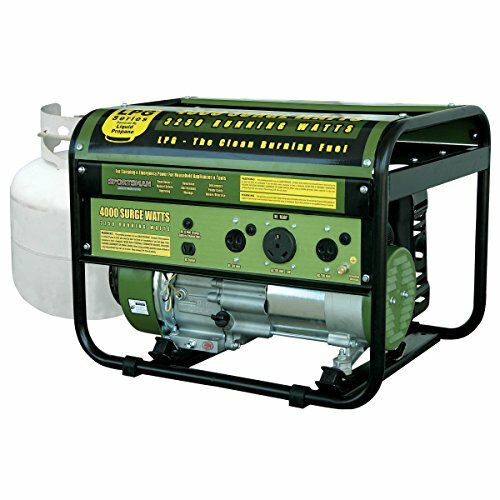 DEDICATED PROPANE GENERATOR – While most of the models in this article are Dual Fuel the Sportsman or the All Power America are ideal if you prefer the simplicity of one fuel method. THE BEAST – If you really need to go big and are looking for a quality hybrid Portable Generator then it has to be the DuroMax XP12000EH this bad boy will give you all the power you need as well as reliability.